Studio apartments, self contained accommodation Kingscliff, Pottsville. Self catering holiday studio apartments in the Byron Bay - Gold Coast region of NSW and QLD, Australia. Affordable holiday cabins and cottages. 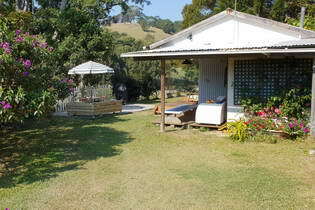 Self contained apartments and self catering accomodation in the Byron Bay - Tweed Heads region of New South Wales and Gold Coast Hinterland, Australia. Self contained studio apartment accommodation and self catering flats, are usually suited to couples or single travellers, and will offer open plan lounge, sleeping, kitchen or kitchenette area, and private or share bathroom facilities. In the Byron Bay - Tweed Heads region of New South Wales, Australia, these are often located in apartment complexes, walk-up apartment blocks and townhouse units, or are properties with separate self contained guest accommodation. Located in a quiet leafy street in Ballina town centre, Ballina Travellers Lodge features an outdoor swimming pool, barbecue facilities and free Wi-Fi. Each room features ceiling fans, flat-screen TV and tea/coffee making facilities. Most rooms have pool views, air conditioning and a private bathroom. Guests have access to a shared kitchen and guest lounge. Clouds on Beechmont offers luxurious self-contained accommodation with stunning mountain views. Guests receive free wine on arrival. All accommodation has been uniquely designed and appointed and includes a flat-screen TV, an iPod docking station and a kitchen or kitchenette. Some boast a private hot tub, sauna or fireplace. Located between Byron Bay and Lennox Head, and set on 15 acres of parklands featuring a landscaped swimming pool with waterfall. Four studio cottages each have a kitchenette and private terrace. Guests receive a breakfast hamper on check-in. Barbecue facilities are provided for each cottage. Within 3 minutes' drive of Byron Bay Main Beach, Cape Byron Retreat offers stunning views towards Mount Warning and the Byron hinterland. All accommodation features a balcony or patio, a kitchen or kitchenette with a microwave and refrigerator, and some have a spa bath. A swimming pool is surrounded by lovely gardens. Nightcap Ridge is a private 67 acre property adjacent to Nightcap National Park. This unique oasis provides beautiful lawns, walks, water holes and unspoilt nature. The self-catering cottage is warm and cosy in winter and light and airy in summer. The slow combustion fuel stove with wood supplied, is a great way to cook and experience food. Located on 35 acres of rainforest and gardens, Tropical Coast Retreat boasts an outdoor pool, a hot tub and mini golf. With free WiFi and a private balcony or patio overlooking the gardens, the air-conditioned self-contained king and queen suites have a spa bath, lounge suite and kitchenette. Pet friendly. Nestled on Tamborine Mountain and situated opposite Witches Falls, this private adults-only retreat offers fully self-contained and individually themed air condited cottages with 2-person spa baths, log fireplaces and free Wi-Fi. Guests are treated to champagne and chocolates on arrival, and also receive a breakfast hamper made up of fresh local ingredients.